The Aircraft Nuclear Propulsion (ANP) program, and the preceding Nuclear Energy for the Propulsion of Aircraft (NEPA) project, worked to develop a nuclear propulsion system for aircraft. The United States Army Air Forces initiated Project NEPA on May 28, 1946. After funding of $10 million in 1947, NEPA operated until May 1951, when the project was transferred to the joint Atomic Energy Commission (AEC)/USAF ANP. The USAF pursued two different systems for nuclear-powered jet engines, the Direct Air Cycle concept, which was developed by General Electric, and Indirect Air Cycle, which was assigned to Pratt & Whitney. The program was intended to develop and test the Convair X-6, a planned prototype for a fully functional nuclear-powered plane. In 1952, the Carswell Air Force Base in Texas was hit by a tornado, severely damaging a number of aircraft. 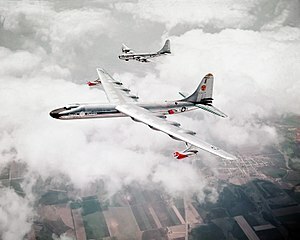 One of the damaged planes was a B-36 bomber, and Convair suggested to the Air Force that it should be converted into an early prototype for the X-6, instead of being repaired. The Air Force agreed to this plan, and provided funding for an overhaul of the plane. The intention was to test flying a plane with a functioning nuclear engine on board, but with it not yet powering the plane at this stage. The original crew and avionics cabin was replaced by a massive lead- and rubber-lined 11 ton crew section for a pilot, copilot, flight engineer and two nuclear engineers. Even the small windows had 25–30 centimetres (10–12 in) thick lead glass. The aircraft was fitted with a 1-megawatt air-cooled reactor, with a weight of 35,000 pounds (16,000 kg). This was hung on a hook in the middle bomb bay to allow for easy loading and unloading, so that the radioactive source could be kept safely underground between the test flights. A monitoring system dubbed "Project Halitosis" measured radioactive gases from the reactor. The NB-36H completed 47 test flights and 215 hours of flight time (during 89 of which the reactor was operated) between September 17, 1955, and March 1957 over New Mexico and Texas. The test flights revealed, that with the shielding used, the crew would not be endangered by radiation from the reactor, including with low-altitude flights, but that there was a risk of radioactive contamination in the event of an accident. In 1957, at the end of its run of flight tests, the NB-36H was decommissioned and scrapped at Carswell. The nuclear reactor was removed. With Cold War tensions increasing in the late 1950s, the US government pushed for development of a heavy bomber with jet engines. Parallel programs of nuclear and conventional aircraft development sought to achieve this goal, but progress on the nuclear plane was slow. President Dwight Eisenhower was not convinced of the need for the program, and he did not assign any urgency to it, although he did maintain funding. By the late 1950s the concept of nuclear-powered planes was increasingly seen by Congress as redundant, given the ongoing advances in supersonic aviation and ballistic missile development. In March 1961, shortly after he took office, President John F. Kennedy canceled the program. In his statement, Kennedy commented that the prospect of nuclear-powered planes was still very remote, despite 15 years of development and expenditure of around $1 billion. The Convair X-6 was never built, and the NB-36H is to date the only American aircraft to carry an operational nuclear reactor. The scientific work carried out for the project did have some lasting value however, including methods for handling liquid metals and fused salts, which aided the development of nuclear generators and reactors used by NASA. The NB-36H in flight. Note the 2 pods; each was mounted near the wingtips of the aircraft and both carried two GE J47 jet engines each. ^ Emme, Eugene M, comp (1961), Aeronautics and Astronautics: An American Chronology of Science and Technology in the Exploration of Space, 1915–1960, Washington, DC, pp. 49–63 . ^ Colon, Raul. "Flying on Nuclear, The American Effort to Built [sic] a Nuclear Powered Bomber". Archived from the original on 2 November 2008. Retrieved 2008-11-05. ^ "Megazone". The Decay of the Atomic Powered Aircraft Program. Worcester Polytechnic Institute. 1993. Retrieved 2008-11-05. ^ a b c d e Jenkins, Denis R. (2004). "X-Planes Photo Scrapbook". Specialty Press. p. 118. ISBN 9781580070768. ^ a b c d Tucker, Todd (2009). Atomic America: How a Deadly Explosion and a Feared Admiral Changed the Course of Nuclear History. Simon and Schuster. p. 130. ISBN 9781439158289. ^ "Convair NB-36: Bomber Aircraft with an Internal Nuclear Reactor". Avia Time. 25 March 2013. Retrieved 5 April 2014. ^ "Converted B-36 bomber (NB-36H)". The U.S. Nuclear Weapons Cost Study Project. Brookings Institution. Retrieved 5 April 2014. ^ Colon, Raul (2007-08-06). "Flying on Nuclear, The American Effort to Built a Nuclear Powered Bomber". The Aviation History Online Museum. Retrieved 2012-01-24. ^ a b c d Kaplan, Philip (2005). Big Wings: The Largest Aeroplanes Ever Built. Pen and Sword. p. 104. ISBN 9781844151783. ^ Atomic Energy Commission and Department of Defense (February 1963). Report to the Congress of the United States – Review of manned aircraft nuclear propulsion program (PDF). The Comptroller General of the United States. p. 141. Retrieved 2012-01-24. ^ Bowles, Mark D. (2006). Science in Flux: NASA's Nuclear Program at Plum Brook Station, 1955-2005. Government Printing Office. p. 78. ISBN 9780160877377. ^ a b Johnson, Leland; Schaffer, David (1994). Oak Ridge National Laboratory: The First Fifty Years. Univ. of Tennessee Press. pp. 76–77. ISBN 9780870498541. ^ Mahaffey, James (2010). Atomic Awakening: A New Look at the History and Future of Nuclear Power. Pegasus Books. p. 264. ^ "Nuclear Powered Aircraft". Brookings Institution. Archived from the original on 2006-03-02. ^ Petrescu, Relly Victoria; Petrescu, Florian Ion (2013). New Aircraft II Color. Books On Demand. p. 92. ISBN 9783848259854. Wikimedia Commons has media related to Convair NB-36H. This page was last edited on 21 March 2019, at 11:54 (UTC).